The legend of Hans Crouse added another chapter on a sweltering Wednesday night at Avista Stadium. 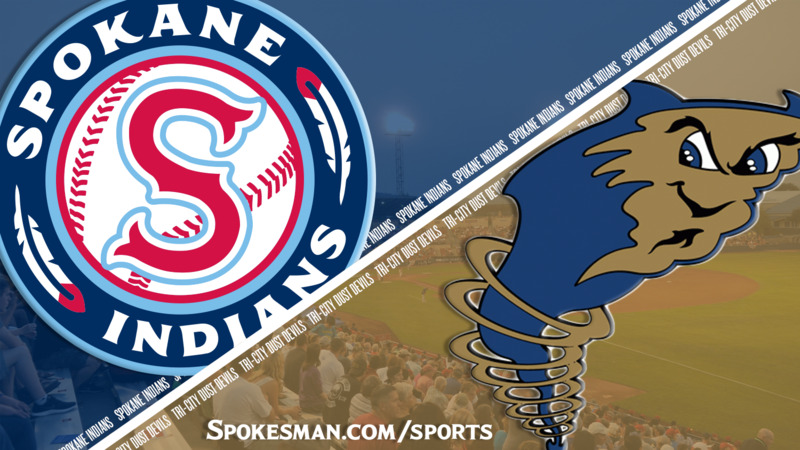 The hard-throwing righty struck out a career-high 12 – without walking a batter – and the Spokane Indians defeated the Tri-City Dust Devils 7-1 in the second of a three-game Northwest League series. Crouse allowed six hits – five singles and a double – and one run while dominating with a 95-mph fastball and devastating slider. Curtis Terry drove in four with a two-run homer – his league-leading 11th –and a two-run single, and Francisco Ventura hit his fourth home run in his last eight games. Crouse struck out four through the first two innings, then the offense picked it up. Jonah McReynolds singled with one down in the bottom of the second, then stole second. With two outs, Ventura hit one the opposite way that carried just over the notch in right field for a two-run homer. It was Ventura’s fourth homer of the season. The Indians (2-0) went back at it in the third. Jax Biggers smacked a one-out single and scored on Terry’s long homer to left. Terry is now one homer short of his total for last season, which led the NWL. Terry’s homer had an exit velocity of 109 mph and an estimated distance of 449 feet. Crouse got into a bit of trouble in the fourth, allowing a single and double with no outs. He picked up a soft lineout to second, then recorded two more Ks to get out of the jam and walked off the field flexing. Crouse’s slider got better as the night wore on. The hits – and runs – kept coming for Indians in the bottom half. With two down, Tri-City (0-2) starter Sam Keating lost his release point. He hit Isaias Quiroz and Tyler Depreta-Johnson in succession, then walked Biggers and J.P. Martinez, the latter on four pitches to force in a run. Keating was lifted and Terry greeted reliever Gabe Mosser with a grounder off the end of his bat past the first baseman and into right for a two-run single and 7-0 lead after four. Crouse picked up two more strikeouts in the fifth, bringing his total to nine at that point. In the sixth, a leadoff grounder bounced off Terry near the first-base bag. Crouse raced over, make the pickup and beat the runner, tumbling at the base. He rolled over and signaled “out” as the umpire did. “I figure this is a once-in-a-lifetime opportunity to play baseball for a living, so might as well have fun with it,” Crouse said. The next play was another grounder to first. Terry and Crouse completed the play in a more routine manner. Crouse gave up a pair of singles, then Blake Hunt ripped one into left and Olivier Basabe beat the throw home for a run-scoring single. After a visit by pitching coach Armold, Crouse came back with a steady assortment of sliders, ringing up Luis Asuncion to end the inning. Armold just had to settle his starter down a bit. Two more Ks in the seventh brought Crouse’s total to 12 and pitch count to 92, both career-highs. Published: July 25, 2018, 9:28 p.m. Updated: July 25, 2018, 10:41 p.m.